I don’t like starting my Sunday by getting angry. Unfortunately, it was exactly what happened to me this morning and cause this emotional blog outpouring. I have a special interest in historical buildings, cultivated since my years in Jakarta and intense research for my final projet in university. Right this minute, an 18th century rubber plantation house is on its way to be demolished. Its brick was sold piece by piece, for a mere 1.200 IDR (or a pathetic few cents). 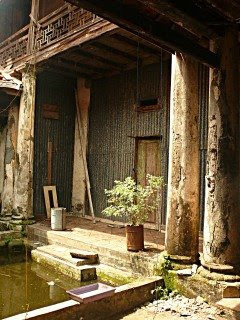 The house is the only remaining heritage of Indische-Chinese-Javanese architectural style in the world. I said the only, because another buildings was already demolished or improperly “renovated” as a shopping mall, as was the case with Candra Naya. Right this minute, while the local Tangerang government absently taking a long weekend off, the tearing continues. This house, said to once belonged to a influential Kapitein der Chineezen Oey Djie San, located beside Cisadane River, has two different façade. The one facing Cisadane River has a Chinese style façade where the one facing the street has a Indische style architecture. Guarding the front door, there used to be two quilin lion statues which now perhaps sitting in a warehouse, ready to be auctioned. 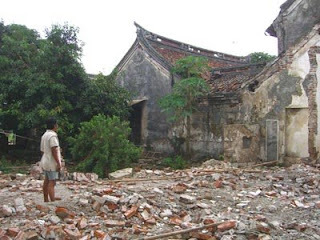 Right this minute, the house which has been raped from its antique ornaments, teak wood (priced 1 million rupiah per m³) and terracotta tiles, continues to be torned down. Later, they will be sold to collectors in Australia and Netherland for God-knows-what-price. Please stop this from happening. A voice can make a different. Please help to save this building by clicking it here. Kindly urge your family and friends to write to the Tangerang Local Government’s website. Don’t let this building becoming the Second Candra Naya!